Hannah Jack was born in 1742, daughter of Andrew and Mary Morrison Jack of Chester, New Hampshire. Her family had emigrated from Londonderry, Ireland, but they were originally Scottish. 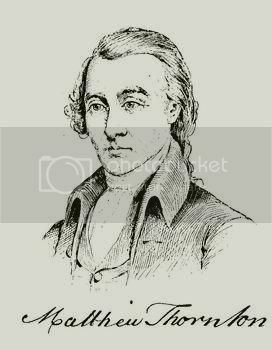 Matthew Thornton was born in 1714 in Northern Ireland, and was brought to this country at the age of three years by his parents, James and Elizabeth Jenkins Thornton. Their family is said to have been among the 120 families who in five small ships, arrived in Boston, Massachusetts, on August 17, 1718, and in the fall of that year went to Maine. When their ship landed in Maine in mid-winter, the passengers had no place to live, so they remained aboard ship. Six of the 56 signers belatedly penned their signatures, eight of them were foreign-born, and four were physicians. Matthew Thornton belongs in all three categories.